We moved a few months ago, and with moving comes the much-anticipated decorating. 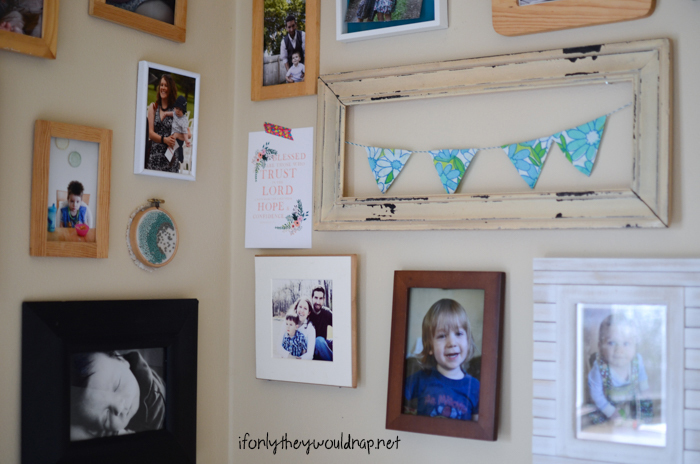 A house doesn’t really have that homey feel until you have pictures on the walls, but sometimes that can be the hardest part! Deciding where everything should go in a new space can be an exciting challenge. 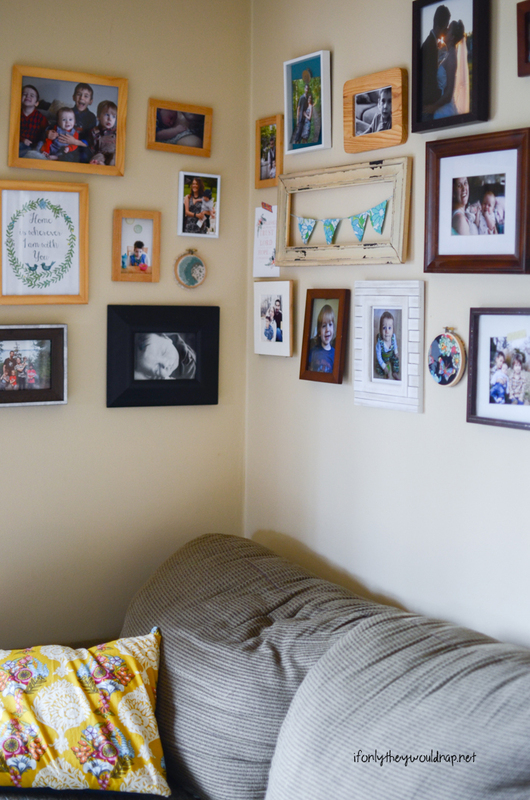 In our previous home, I made a gallery wall in our living room that I absolutely loved. In our new home, however, there isn’t a wall large enough to re-create a similar wall. 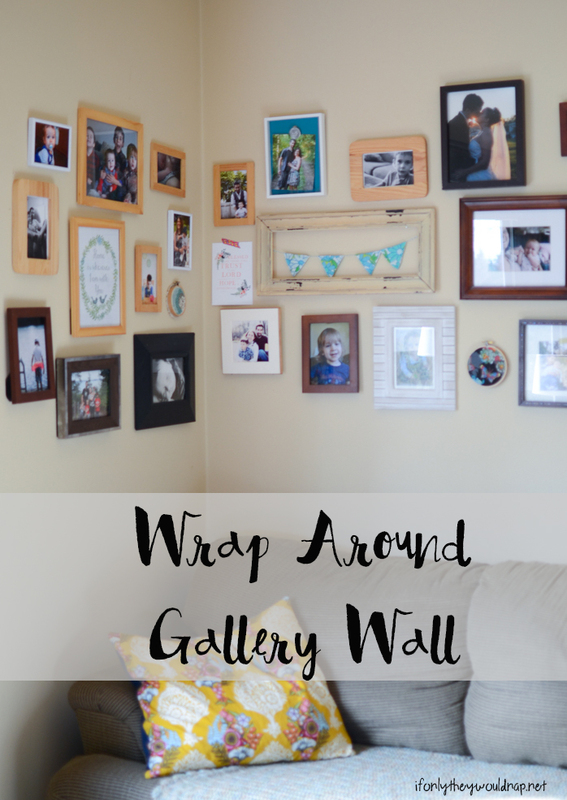 So I wrapped it around the corner to create this wrap around gallery wall – it’s perfect for the space! The goal of my gallery wall is to fill the space with photos and art that reflect our family and the creative spirit of our home. Some people like to cut pieces of paper the same size as the frames, tape them on the walls, and see how it works. That’s a little too Type A for my personality. ;) Instead, I lay everything out on the floor and rearrange it until it has a good feel. I take a picture of the layout on my phone so that I can reference it as I’m hanging everything up on the walls. I don’t measure, though that might work best for you. I just hang them up one by one and move if necessary. Don’t be afraid of nail holes! As Myquillyn Smith (The Nester) says in her book The Nesting Place, “Is there anything in life less risky than creating a one-millimeter hole in a wall that can be filled with your finger and some putty in two seconds?” I ended up with extra nail holes in the wall due to a few minor adjustments, but no one knows they’re there but me. 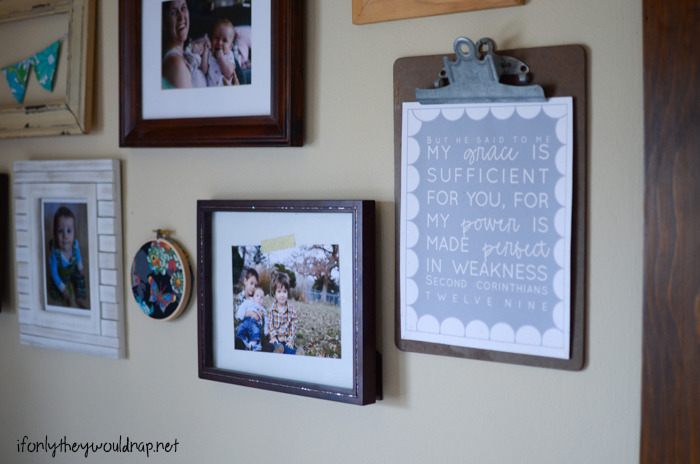 My wall has a mixture of fabric, art, Scripture, and photos. That’s a pretty clear representation of our home and our family. You can find the tutorial for the bunting here. Not everything has to match or be the same color! 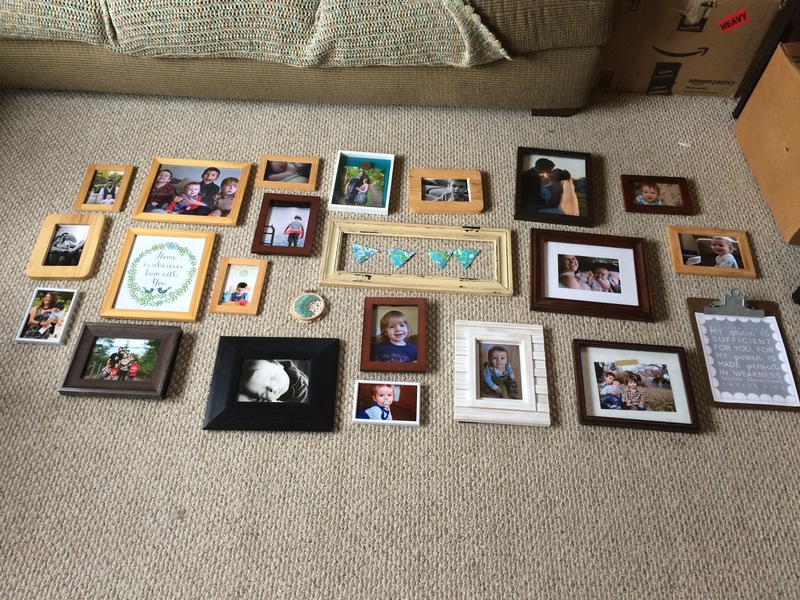 Over the years, I’ve collected about 14,000 picture frames of various sizes and colors, and when thrown together in a gallery wall, they create a great eclectic vibe. 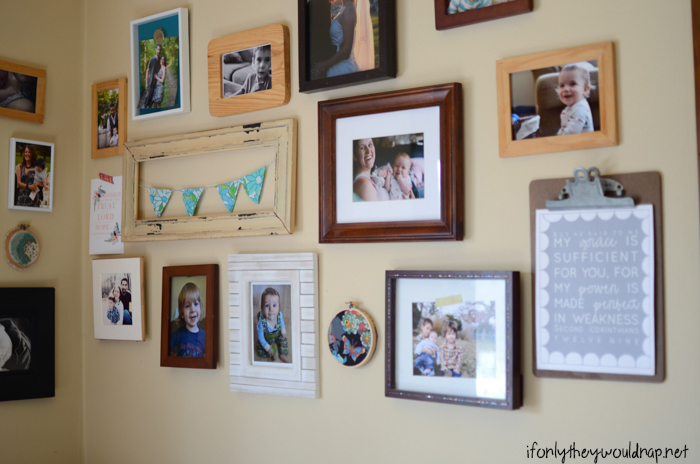 Have an extra space to fill in your wall? 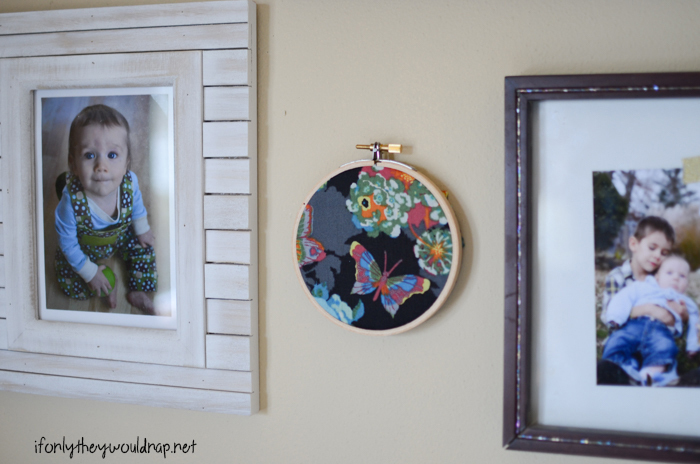 Grab a small embroidery hoop and a scrap of fabric to add some texture and color. 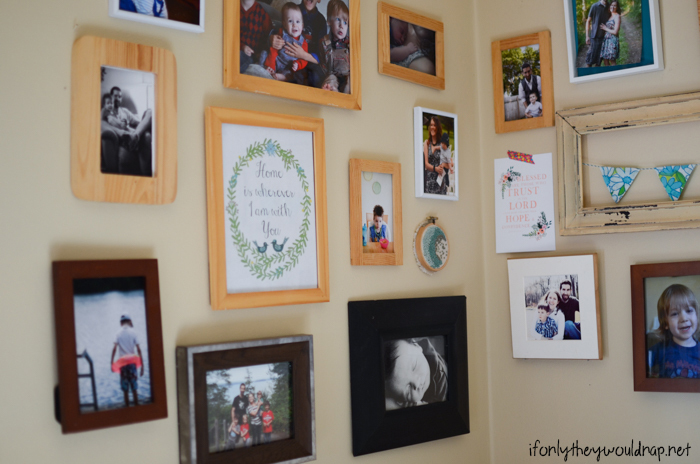 I love how this wrap around gallery wall turned out! Decorating isn’t about following rules or spending lots of money on coordinating items, but taking risks and having fun with what you have. 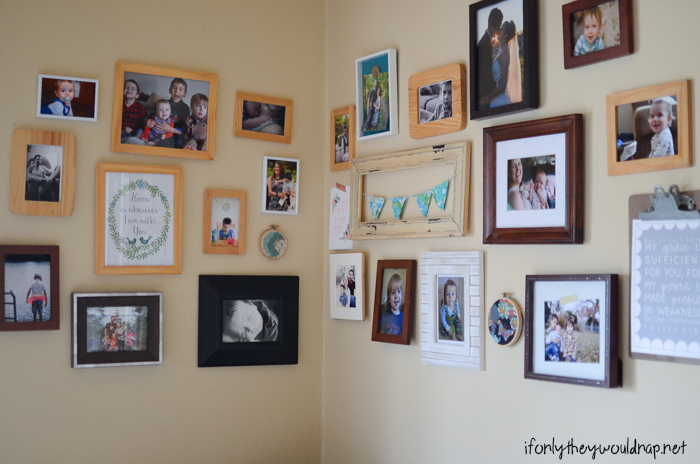 Have you made a gallery wall? I’d love to see it!